I have a confession to make. We have a non-traditional Christmas Eve tradition. Well, not normal for anyone I know at least! It all started when we lived in Los Angeles. Anyone who has moved away from family for a job, college, marriage or whatever reason might be able to relate. If you have always called the same place home, maybe you’ll get to see the holidays through a new set of eyes. Moving was difficult, but we did it for the job opportunity. Southern California was a long way from Iowa, but it brought with it a lot of perks including beautiful weather and lots of things to do year-round. We thought that our family and friends would be clamoring for our guest room in an effort to get out of the bitter winter chills of the Midwest. That couldn’t have been further from the truth. Ultimately we found ourselves far away from family during the holidays and alone. We decided to start our own tradition, attend Christmas Eve mass then go out to dinner. Know what? Not many restaurants are open on Christmas Eve. We discovered that Asian restaurants were the exception and by default, that became our tradition. Now we are adding a new layer to it by incorporating game night into our Christmas Eve plans. 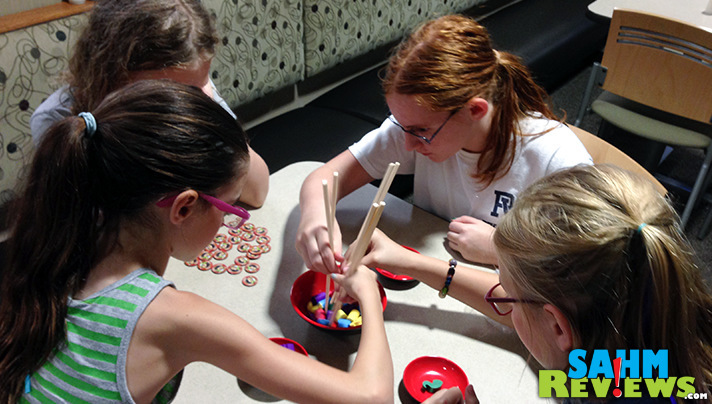 What better way than to keep the theme going with a game centered around chopsticks: Chopstick Dexterity! Let me start by saying that dexterity games are not my strong suit. Actually, anyone my age or older may be able to claim the same. It takes a steady hand and good eye/hand coordination for most. More often than not, the younger players claim the win. 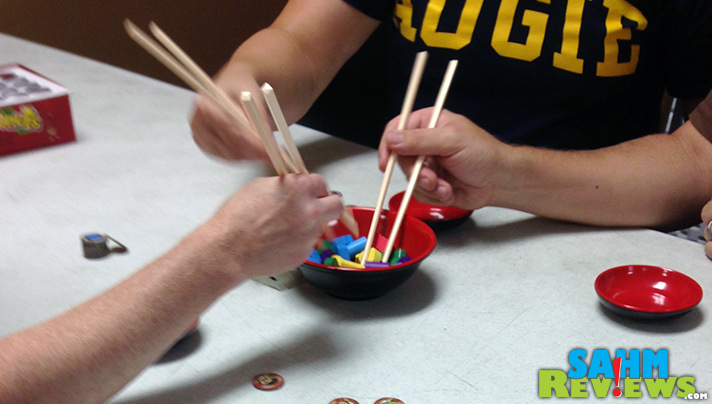 Chopstick Dexterity by Mayday Games is different in that age, wisdom and experience give adults the upper hand! 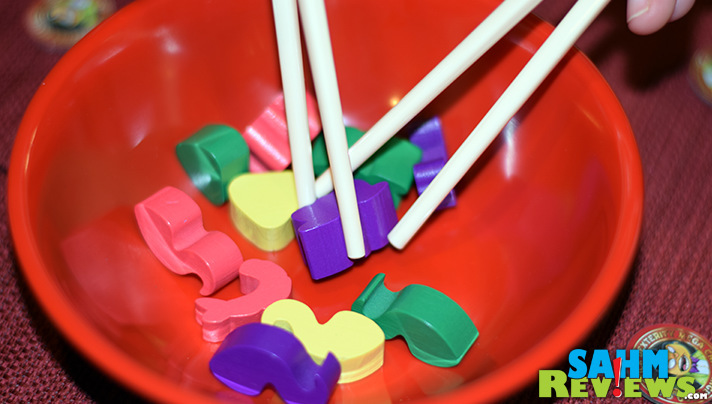 As the name appropriately describes, this game is all about how good you are with a set of chopsticks. 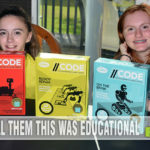 We decided if the kids want to play, then they need to use the components in the game. No cheating with kiddie chopsticks or ones amended with a rubber band. If the kids want to win, they need to learn the right way to handle a real pair of chopsticks and they need to learn to do it well. I’ve been practicing for this game since I was about 8 years old when I won a set of chopsticks in a contest through our local newspaper. Am I competitive in general? Yes. When I play Chopsticks Dexterity, you can multiply that aggression by 100. The basis of the game is simple. 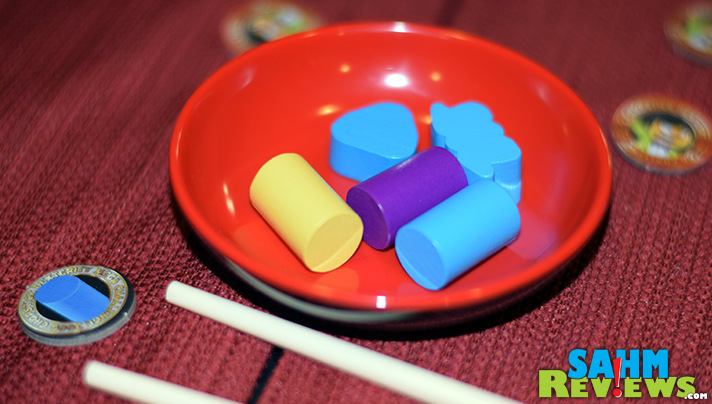 The game consists of the previously mentioned chopsticks, five colors each of Shrimp, Tentacle, Nigiri, Onigiri and Sushi Roll, a large community bowl, individual player bowls and game tokens featuring the various types of sushi. 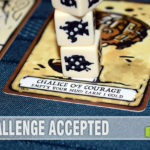 Over the course of multiple rounds, compete to win tokens the person who has the most at the end wins. So how do you get your hands on those tokens? By being really good at picking up stuff with chopsticks, of course! Each token shows a picture of one of the items in the community bowl. 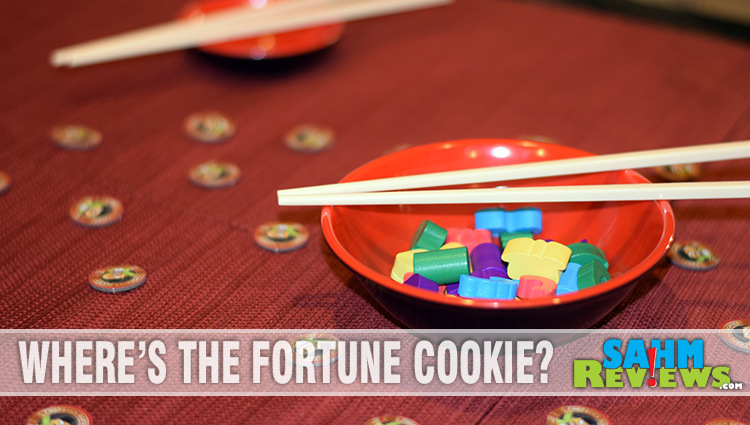 Each round, one of the tokens is flipped over then everyone simultaneously fishes the matching items from the bowl. If a piece of blue nigiri is shown on the chip, all nigiri as well as all blue items are valid. When everything that matches has been claimed by one of the players, the round is over. Everyone counts what they have collected in their personal bowls and the one with the most gets the token. Sounds easy, doesn’t it? It’s not. 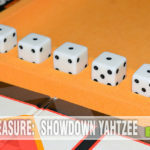 While you’re trying to pick up an odd-shaped, wooden piece from the crowded bowl, your opponents are doing the same. It’s cramped quarters. Using chopsticks can be challenging enough but add on an element of chopstick ninja work and it’s even harder. Now do that same task several more times until all the tokens are gone. You realize just how good (or not) you are at holding and maneuvering a set of chopsticks. We’ve played it several times with both kids and adults and it’s always a winner. Everyone walks away energized and hungry for sushi! This isn’t your traditional board game, but our holiday traditions aren’t normal anyhow. Grab some sushi or Chinese takeout, gather the family and enjoy some quality time. Traditions start somewhere and we’re good at starting our own. Check out what other great titles Mayday Games offers, follow them on Twitter or visit their Facebook timeline for updates, promotions and giveaways! This game sounds like it could be a real hoot. I am the worst with chop sticks, I cannot even get food into my mouth. I have yet to master the art of using chopsticks. My eye hand coordination has never been all that good to begin with and when at a Chinese restaurant-well lets just say I very quietly ask for a fork!! And yes, like you I have spent many a holiday night at a Chinese restaurant–Christmas is not the only day all the other types are closed!! This does sound like a game that would take a lot of concentration and would be a fun party game! My family would love this! 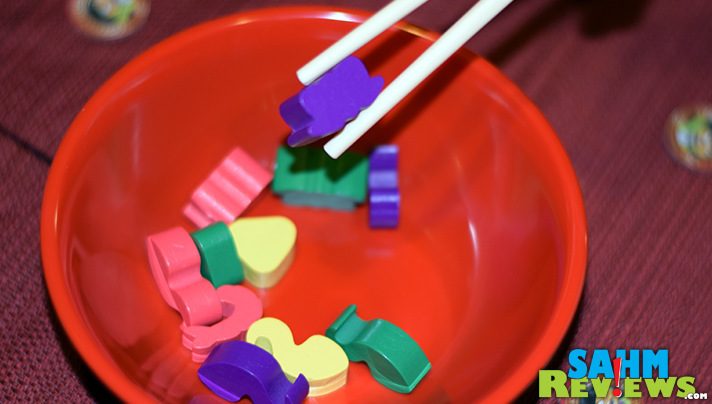 I use chopsticks quite regularly and my oldest son likes to use them, too, so I think this could be a game we could both enjoy attempting to beat eachother at as I am sure we both think we’re better than the other with our skills!! 😀 Thanks for sharing this, I am going to go seek it out! LOVE this post and I need to work on my chopstick dexterity. My Hubs loves Chinese and Japanese food… especially sushi. When we go out, I can never use my chopsticks like everyone else. I imagine this would bring on loads of laughs for everyone! I am not good with chopsticks, but if everyone was, the game wouldn’t be as fun, right? I love this idea! Not only is it fun, but after playing this, I can stop being that ONE person in a Chinese restaurant using western utensils. I would love this game! I swear, I’ve tried using chopsticks a million times and have yet to master them! We love our Christmas Eve tradition of having a big pizza party, so I totally understand. 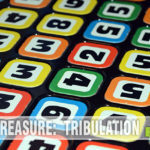 This game would be great for our son who is on the autism spectrum and often has issues with fine motor skills. Okay, I am horrible with chopsticks! I can imagine that it would be a hilarious game to watch kids try to master! This game sounds so fun! I am not so good with chopsticks so I may not be good at it but it would be fun to try! I guess I am never too old to learn. This game looks like a whole lot of fun and laughter for the whole family. Maybe I should start practicing. I’m good with chopsticks, I’ve been living in Japan for the last 15 years.